The Sabona 339 Executive Sport Gold magnetic bracelet is a sharp combination of brushed stainless steel and 18k gold plating. Very unique and popular! A 1200 gauss samarium cobalt magnet is in each large link. There is a 1200 gauss magnet in each large link! The links in this bracelet are approximately 1/2" wide. Sizing: Your wrist size will be very close to the size of the bracelet you need. Be sure to consider how loose or snug you want your Sabona to be. 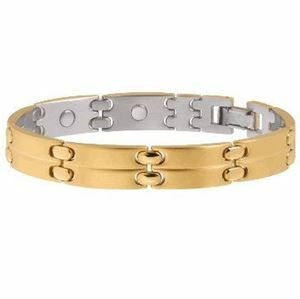 Magnetic Bracelet sizes are Large (7.5") or Extra Large (8.0"). Use a string or fabric tape measure to obtain wrist size.